Canterbury is a historic English Cathedral city and home to several UNESCO World Heritage Sites. Situated in the idyllic Kent countryside, the city is well-known as the location of Canterbury Cathedral, one of the oldest Christian places of worship and home to the leader of the Church of England. Discover the Cathedral’s extraordinary architecture, stain glass windows and the shrine of St Thomas Beckett. Other highlights of the city include a visit to St Augustine’s Abbey, Howletts Wild Animal Park and Westgate Gardens, as well as enjoying the boutique shops and restaurants. Many visitors choose to take a tour to Canterbury and often combine a visit to other nearby sites. Check out our English towns and cities page to check out other nearby areas. 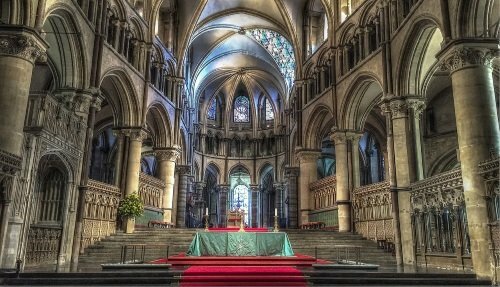 Canterbury Cathedral has been at the centre of Christian religious life in England for over 1700 years. Admire one of England’s greatest buildings, with the oldest parts dating from 1070 AD. 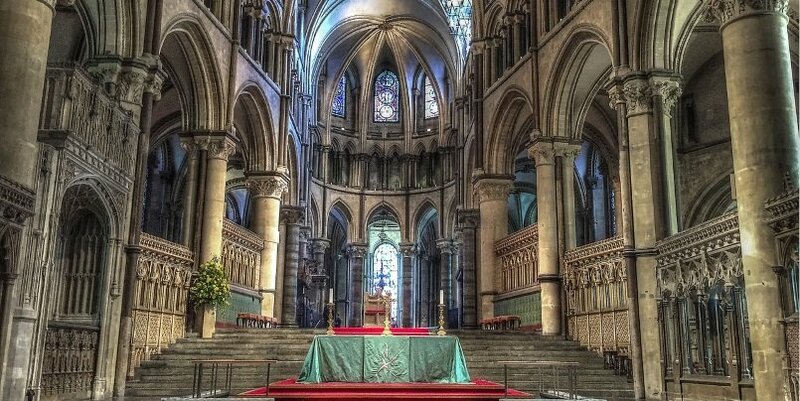 Visit the north-west transept (also known as the Martyrdom) where Archbishop Thomas Becket was murdered on 29 December 1170 by knights of King Henry II. Admire the stunning stained glass windows of the Trinity Chapel completed in 1184 and hear the hour struck on the bell called ‘Great Dunstan’, one of the 21 bells in the Cathedral housed in 3 bell towers. Founded around 597 AD by St Augustine, the remains of this abbey mark the start of the rebirth of Christianity in south England. It is a designated world UNESCO World Heritage Site, with fascinating archaeological remains. Admission also includes an audio tour and entrance to the museum. 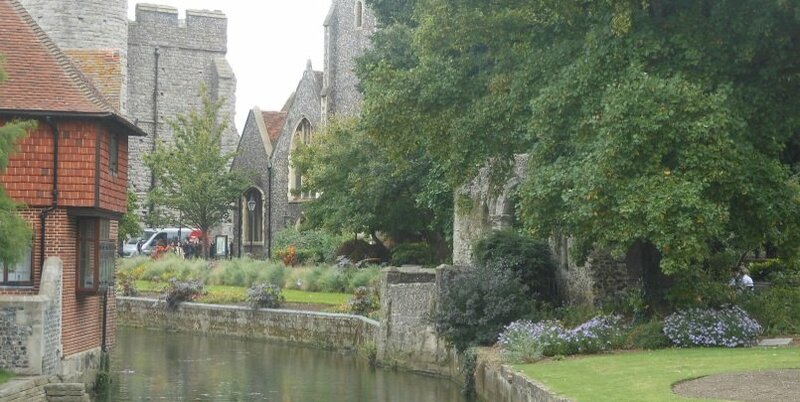 These gardens are a central part of the city of Canterbury. Since the Middle ages, residents and visitors have come to the gardens to relax and enjoy the beautiful surroundings. Highlights of the park include the Norman archway, 200 year old Oriental plant tree and war memorials to the Burma and Italian campaigns of WWII. Howletts Animal Park has over 400 animals, including rarer species like baby rhino, baby elephants, and giant anteaters as well as gorillas, tigers, and leopards. Our One Day Tour of the Southern England from London is a cost effective and fun way of visiting Canterbury. We also offer a 3 day tour of Southern England which also includes a visit to Canterbury. Canterbury is easily accessible. Regular train services run from London Charing Cross and London Victoria, with the journey taking approximately 30 minutes. Trains also run from the from around Kent. The National Express Company provide a great service, with frequent coaches running from to Canterbury from London Victoria Coach Station. Canterbury has good road links with the M20 and M2 connecting it easily to London and major airports. It is also in close proximity to Dover via the A2 and A260. Many visitors choose to rent a car in order to easily explore the areas surrounding Oxford, which can be less accessible by public transport.